Science Seeks Clues To Human Health In Neanderthal DNA : Shots - Health News Some of the genetic variations in human DNA that have been linked to quick clotting or depression or diabetes lie within or near the genetic stretches we picked up from Neanderthals, a study finds. 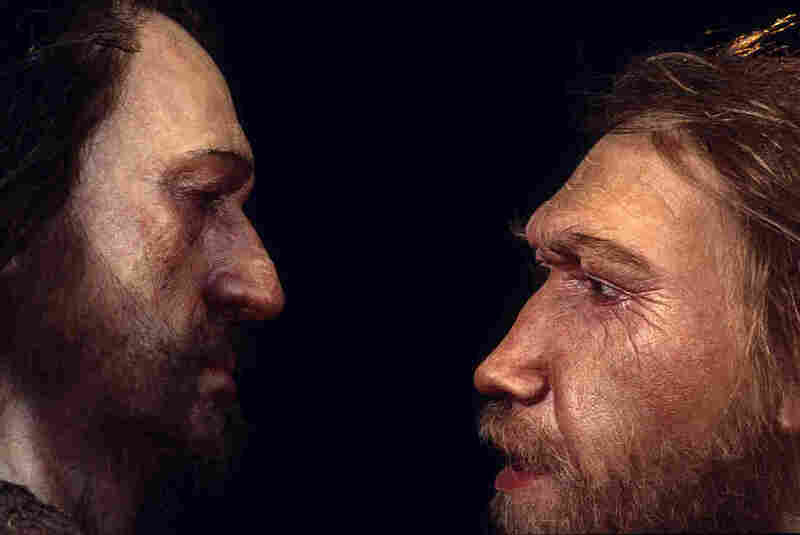 A reconstruction of a Neanderthal man (right) based on skull found at the La Ferrassie rock shelter in Dordogne Valley, France. He's face to face with a male Homo sapien. If you've ever seen what a Neanderthal is supposed to have looked like, it might be hard to imagine mating with one. But modern humans did. We know because, a few years ago, scientists found stretches of Neanderthal DNA in living humans. And now there's evidence, from a study published Thursday in Science, that some of that DNA might help shape our health. If you look at a Neanderthal skeleton next to a modern human skeleton, the Neanderthal looks stocky, barrel-chested, and rather brutish. Neanderthals were genetically different but, nonetheless, the closest relative to modern humans — Homo sapiens. The Neanderthals lived in Europe and western Asia. Modern humans initially lived in Africa. Then, about 60,000 years ago, some of those modern humans got restless and traveled to Eurasia. They met the Neanderthals there, and apparently some liked what they saw. They had kids. Those kids got genes from both groups, and some of those genes were passed down to many of us. Genetic researcher Tony Capra, of Vanderbilt University, has found some intriguing Neanderthal genes among modern Americans. "For example," says Capra, "we found a specific bit of Neanderthal DNA that was associated with increased amounts of blood clotting." Capra says his colleagues also found Neanderthal DNA that's associated with things like an increased risk of actinic keratosis, a condition that causes growths on the skin. And they found another bit of Neanderthal DNA that was unusually common among people with depression. But Capra notes that these are just associations — the study couldn't say whether the preserved bits of Neanderthal DNA are direct contributors to these conditions. "This Neanderthal DNA influences [a] general bodily system in humans," he says, meaning the circulatory system, for example, or the skin or the brain. "But it doesn't mean it was bad for us or bad for them." And even if some of the Neanderthal DNA we carry around did contribute to our propensity for one or another illness, many inherited medical conditions are influenced by the environment and/or numerous genes. Having one piece of Neanderthal in the mix isn't likely to have much effect. Still, Capra says it could be that some bits of Neanderthal DNA stuck with us because at some point it helped H. sapiens adapt as they spread across the planet. For example, Capra says, the Neanderthal version of a blood-clotting gene might show up more often than expected among modern humans because quicker blood clotting promotes quicker healing and can help prevent pathogenic microbes from gaining a foothold. It could be that the Neanderthal version of the gene or genes worked better at fighting the microbes found in Eurasia. So whoever had that version had a better chance of surviving and passing that stretch of DNA along through the next generations. Kenneth Weiss, a geneticist at Penn State, says the closer scientists look for these bits of shared DNA, the more they'll find. "It's interesting but it's not a surprise anymore," Weiss says. The genetic mashup between Neanderthals and humans from Africa, he says, isn't that different from the way we all exchange genes now. For example, "you're going to find evidence for things in Mexican-Americans that came from Europe and that came from Native Americans," he says. It's just that Neanderthals and the first modern humans weren't as different from each other as people once thought, Weiss says. In a way, the research shows that our species evolved much the way languages do — made up of bits and pieces of whomever we met and lived with along the way.